Landslides, in and of themselves, constitute a major geologic hazard. They are widespread, result in $1-2 billion in damages and cause more than 25 fatalities each year. 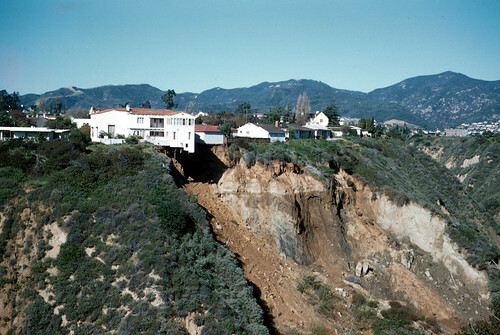 Landslides are frequently triggered by strong ground motions. They are an important secondary earthquake hazard. Slope material that becomes saturated with water may develop a debris flow or mud flow. The resulting slurry of rock and mud may pick up trees, houses, and cars, thus blocking bridges and tributaries causing flooding along its path. Landslide hazard maps provide planners and engineers a picture of where this hazard must be carefully assessed before development can safely occur in high risk areas. Landslides triggered by earthquake shaking are a major concern in the Pacific Northwest. Earthquake Point in Chelan County, Washington, near Entiat is named after the ~ M7 1872 earthquake that struck nearby. The shaking split the mountain, forming the cliff to the west and causing a huge rockslide which stopped the flow of the Columbia River for several hours. A recent study suggests the next big quake on the Seattle fault may cause devastating damage from landslides, greater than previously thought and beyond the areas currently defined as prone to landslides. Published online Oct. 22 by the Bulletin of the Seismological Society of America (BSSA), the research offers a framework for simulating hundreds of earthquake scenarios for the Seattle area. 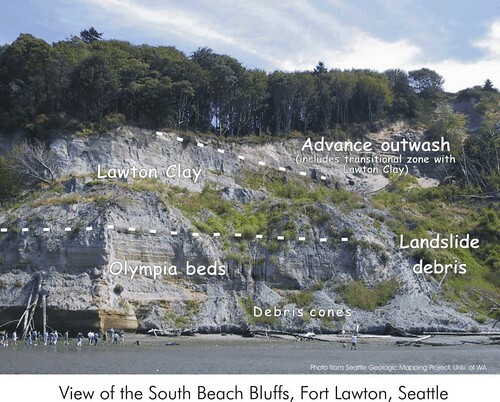 Large and small landslides occur frequently in the Puget Sound area, where glacial geology dominates, and evidence has been uncovered that details large block landslides into Lake Washington and Lake Sammamish about the time of the Seattle Fault Earthquake approximately 1100 years ago. [One enterprising individual was arrested in the 1990s for harvesting old growth Douglas Fir trees still in upright position from the floor of Lake Washington where they had been deposited by a landslide triggered by that earthquake.] Landslides into and under bodies of water can also generate tsunami or seiche waves that can be locally quite distructive. Heavy rainfall can saturate the ground greatly increasing pore pressures particularly where porous soil layers meet less permeable soils such as clay and then move out along that boundary toward an open face or bluff. Strong earthquake ground shaking greatly increases the likelihood of landslides where landscape is susceptible to these types of ground failure. If the ground is saturated with water, particularly following heavy rainfall, the shaking will result in more landslides than normal. The Washington State Department of Ecology has published information about landslides, historic events, and mitigation. The City of Seattle offers vauable landslide hazard, preparedness, and policy information. Learn more about Oregon landsildes from DOGAMI.